One hour from Torino, escape into the bucolic hills of Piedmont. 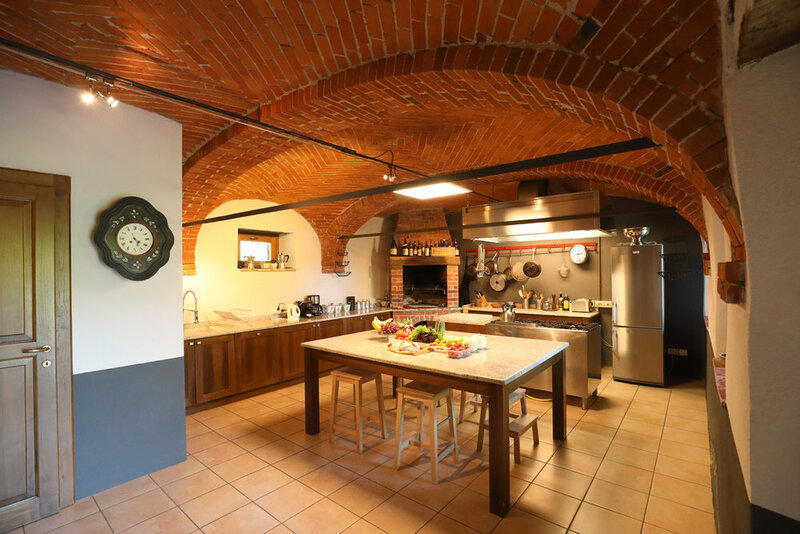 This beautiful 17th Century stone villa sits on 5.6 hectares (fourteen acres) at an altitude of 600 meters (2000 feet) near the small village of Bonvicino and four miles from Dogliani, in the heart of Piedmont, Italy. 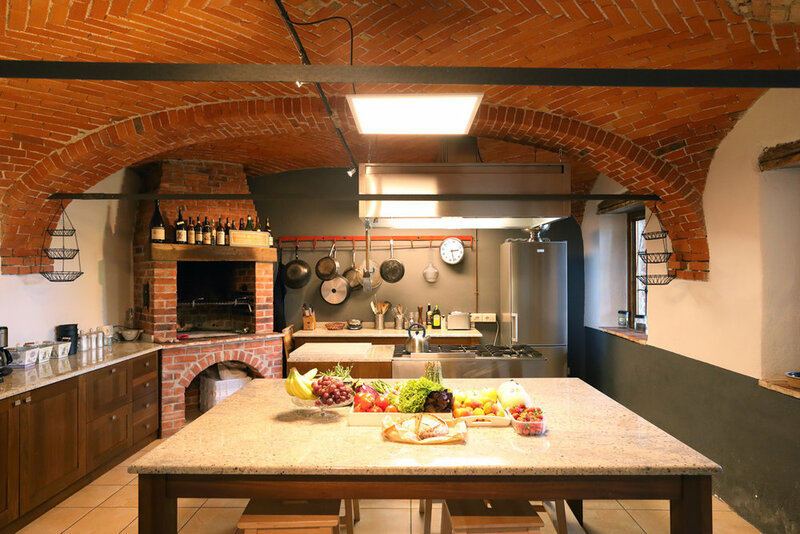 Villa San Lorenzo di Bonvicino provides a perfect base for exploring the Piemonte region. Enjoy walking through Italian hill towns and vineyards, visit the well-known towns of Monforte D’Alba and Barolo (nine and 12 miles away). Sit on the balcony, sipping your morning coffee or enjoying a glass of wine at sunset while gazing out at the rugged and lush green mountain landscape. On clear days, enjoy spectacular views of the Alps. I purchased and renovated Villa San Lorenzo because we wanted to provide a beautiful oasis for vacationers seeking delicious food and wine, lovely hikes, untouristed villages and enjoy a slower pace. The villa’s renovation was completed between 2008 and 2015, including new bathrooms, gourmet chef’s kitchen, beds, linens, antique furnishings, British satellite TV, high-speed internet, plumbing, electrical. 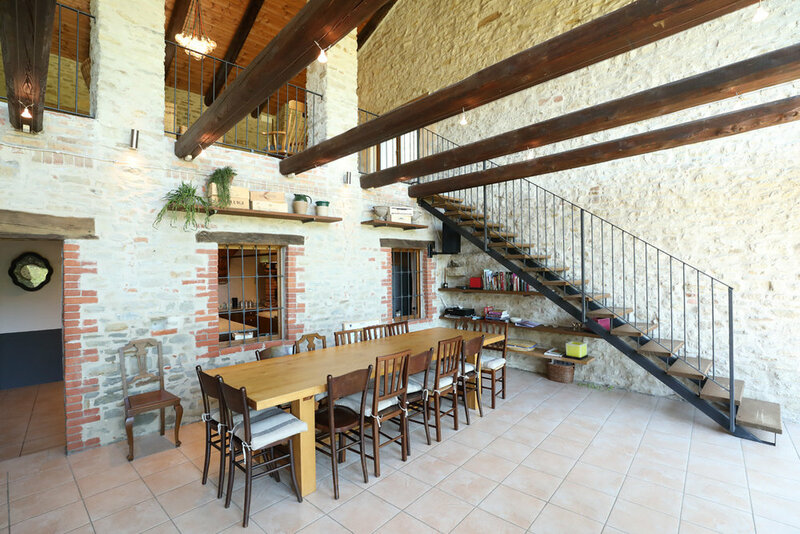 Modern conveniences are combined with the antiquity of this centuries old farmhouse. Furnishings combine comfort in keeping with the style of the region and preservation of the house. There are seven bedrooms (Four rooms with Queen Size Beds, 3 rooms with the choice of 2 single beds or one queen bed). Seven modern bathrooms total with bath/shower, and one WC off of the chef’s kitchen. The villa includes a large chef’s kitchen with six (6) gas burner stove, as well as a smaller fully equipped kitchen, two living spaces and one large dining/living space with floor to ceiling windows. The property offers privacy, spectacular views in a beautiful peaceful setting. Perfect for a family or a group of friends. I loves to bake bread and pizza so I added a wood-fired traditional brick oven for pizza and bread in 2007. Swim in the 11 x 5 meter (36 feet x 16.5 feet) swimming pool with a view of Murazzano and the Italian Alps. Dine at the stone table overlooking the hills of the Alta Langa. Enjoy cooking in the gorgeous chef’s kitchen, dining al fresco, or choose from one of the region's many delicious restaurants. Local cuisine offers fresh regional dishes based on seasonal ingredients. The property is completely private, nestled in the Alta Langa hills. Just minutes from town (cafes, restaurants, shopping, cinema), you will feel peacefully secluded on this spacious property. Pick fresh figs, apples, cherries, and blackberries just outside your front door. Walk directly from the house to view hawks, warblers, finches, sparrows, rabbits, deer, fox, coyotes, or drive to one of the many walks nearby. Local wineries abound, featuring the internationally acclaimed Barolo and Barbaresco wines. The nearby town of Alba is known as the home of the famous white truffle. Bra prides itself on being the heart of the Slow Food movement. Nearby Cherasco is known for its famous chocolate, as well as offering a cultural museum and film retrospectives. Horseback riding and swimming are just minutes away.Dogliani offers a choice of cafes where you can sample homemade gelati, enjoy a cappuccino or stay for lunch or dinner. Visit the farmer’s market in a different local town each day of the week. Take a walk or drive to Bossolasco to sample their famous chocolates (including a variety of hot chocolate beverages) and views stretching over the entire region.You may want to take a trip to the Italian Riviera near Savona on the Ligurian Coast or to the Alps for skiing or hiking, both about an hour's drive away. Cinque Terre, Nice, and Milan are approximately two hours away. All linens provided. Daily or weekly cleaning available at additional cost. Please email me at clay@29vsl.com in order to check availability and plan your visit to this stunningly beautiful part of Italy and share in La Dolce Vita!